My name is Mrs.Stephanie, owner of Splash Kids. I have experience teaching kids for over 8 years. I graduated from Houston Baptist University with a B.A. in art education. 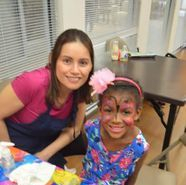 I have experience through Houston's Parks and Recreation and Galena Park ISD and child care. Teaching art is my passion, and I am glad to help kids reach their creativity in the arts. My Name is Ms. Angela, and I am a portraiture fine artist. In less than 5 years of doing art, I had my work shown in a museum. I love working with kids and bringing them to their fullest potential. In the past, I coordinated kids summer enrichment camps, and shown their work at an art gallery. I believe everyone is an artist in some way, they just haven’t discovered it yet. I graduated from UHCL this year and received my art education degree. 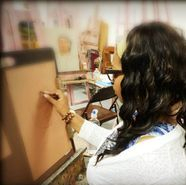 I am a certified art educator teaching High School art. I love art and math. I look forward towards helping our students be successful. My name is Julia Smith. I love working kids! And have a passion for face painting. It brings me a lot of joy seeing the kids smile after getting their faces makeover. In the past, I’ve worked with Angela Smith doing summer art enrichment camps and parties. I am currently going to college. I love helping kids be creative and I am happy to be a part of the A Team!